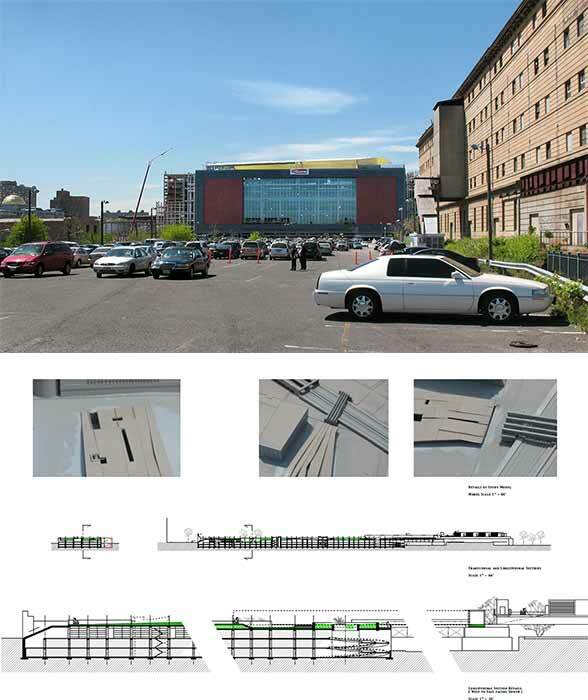 The Arena Plaza design study explores the possibility of linking by means of a publicly accessible urban landscape two important centers of Newark’s urban life; the Newark Penn Station and the newly constructed Devils Arena. The design incorporates a number of underutilized lots and an abandoned railroad structure to enhance the area as the city’s vital center as well as to emphasize the city’s important historic heritage. The proposed park fronts the Devils Arena and has three levels containing commercial space, parking and recreational landscaping. It both references and incorporates components of the existing industrial elevated railroad bridges and ramparts over the McCarter Highway. The track rail lines of the old railroad bridge are reflected back into the park to define landscaping features – board walks, lawns, water basins, trees, and a variety of openings to the lower parking and commercial levels. The existing old railroad bridge is proposed to be reused to house restaurants and other commercial venues and to extend passage thru ramps and elevators to Newark Penn Station. The public park is approximately 130,000 sq. ft. The three lower levels contain approximately. 374,000 sq.ft. of parking (approx. 886 parking spots) and 23,800 sq.ft. of commercial space and other support facilities for the park and the community.